Make your holiday celebrations something extraordinary with a Party Favors' custom designed cake. Whether you are planning an intimate get t ogether or opening your home to a crowd, our holiday cakes will make your celebration deliciously memorable. 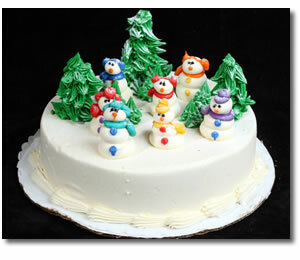 Feel free to browse through our Holiday Cake catalog for ideas. If you are looking for a unique design, just let us know what you have in mind. Our knowledgable staff will work with you to create just what you had in mind. Customized cake designs are our speciality. Once you have selected a design, look over our Fillings/Flavors page to select just the right flavor for your holiday. Unsure what size cake will feed your gathering? No problem, our convenient Cake Sizes page will help you find the best cake for your holiday.